Gray fox dens may be in use any time of year, but the majority of use comes during the whelping season, or the time of year when birthing occurs. Dens are usually located in wooded or brushy habitats, and are generally less obvious than that of a red fox. They do not excavate their own den and infrequently use abandoned dens of woodchucks or other small mammals. They prefer to use hollow logs or trees, rocky outcrops, or thick brush. They will also use abandoned houses or beneath manmade structures such as sheds or abandoned woodpiles as both temporary dens and a place to rear their young. Tree climbing is one of the most notable adaptations in the gray fox. Gray fox have been reported to den several yards above the ground. This is not only advantageous in escaping predators such as coyotes, it may also improve their ability to find food. By gripping the bole of the tree with their front paws, and as they push off with their hind feet, they will let go with their front and re-grip the bole of the tree higher up. Once they’re up in the crown they tend to jump from branch to branch. Descent is backwards or if the tree is leaning they will run down the trunk of the tree. 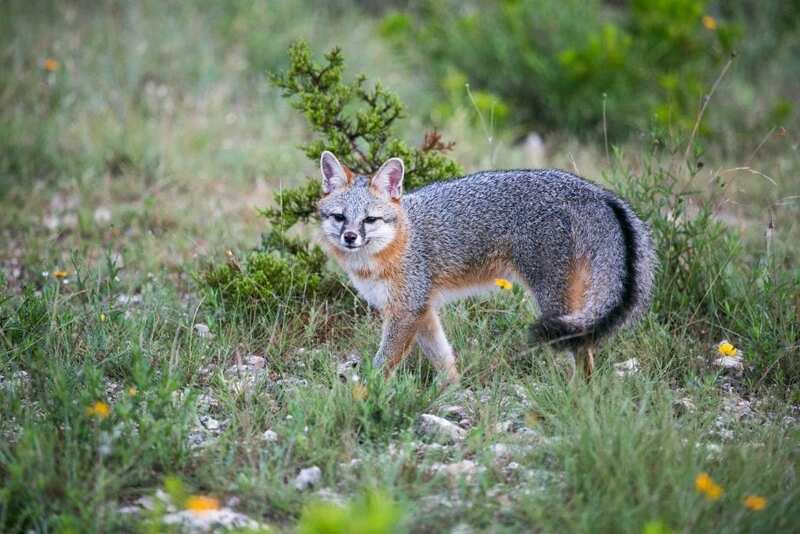 Due to their more aggressive behavior, Gray fox prefer to hunt thicker cover than the more timid red fox. The gray fox’s preference for thicker cover, aggressive behavior, and the ability to climb trees minimizes the effect that eastern coyotes have on their population. The red foxes preference for open terrain where they are more visible and farther away from cover allow coyotes to suppress red fox populations where coyotes are abundant.